Puli Joodham (2019) The film starts with three gruesome murders. To handle this case, ADCP Mathew(Mohan Lal) is brought on board. Upon investigation, Mathew finds out that all the murders have a connection with a guy named Madanagopal(Vishal). Who is this Madanagopal? What does he have to do with these murders? Will Mathew nab Madanagopal? To know the answers, you need to watch the film on the big screen..
vishal and mohan lal back with an action entertainer ,rashikhanaa and hansika are in glamour rolls ,srikanth in specail character ,all and all good crew and director unnikrishna was written and directed well this story ,music also good ,already teasres and trailers are made trending in social media so hope movie will be a block buster on this week . 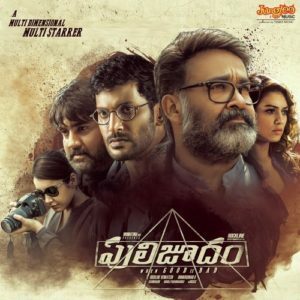 puli joodham ,mohan lal and vishal was acting together in this movie rashi khana and srikanth was acting also ,movie was action and thirller entertainer ,b unnikrishna was directed this movie ,in telugu also its releasing ,vishal and mohan lal had a market in telugu ,so hoping movie will be a block buster in box office . On The Whole, Puli Judam Is A Crime Thriller Which Is Narrated In A Very Ordinary Manner. Irrespective Of A..